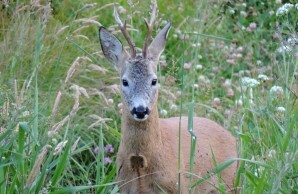 Roe deer use magnetoreception to flee in a common direction. When herd animals, such as deer, flee from predators, they appear to coordinate with one another to avoid collisions and maintain group cohesion. How is this synchronized flight from danger achieved? Recently, a group of scientists led by zoologist Hynek Burda of the University of Duisburg-Essen in Germany and doctoral student Petr Obleser of the Czech University of Life Sciences tested the possibility that roe deer (Capreolus capreolus) use magnetoreception—a sensitivity to the Earth’s magnetic field— to coordinate their escape when threatened. Building on previous findings that roe deer are most likely to align their bodies along the north-south axis while grazing and resting, the team investigated whether or not the animals also tend to escape in a north or south direction. The researchers evaluated deer behavior at sixty locations across three hunting grounds within the Czech Republic. Experienced wildlife biologists and rangers approached the animals at each site, carefully noting a number of factors including the weather, sun position, wind direction, visibility, proximity to shelter, and their own distance from the deer, until they startled the animals. Direction of escape was then recorded.